As has become an annual tradition, it’s time to put the spot light on YOU the fans and YOUR hockey stories! This is open to ALL Vancouver Canucks fans AND Utica Comets fans! What does that mean? It means featuring YOU, the fans on the blog ALL summer long. As we count down to the new season around the corner, it is time to share your Canucks/hockey stories and how you became a fan of this team, the game and what keeps drawing you back year after year. Over the past four summers, I have had the absolute pleasure of connecting with Canucks fans from all over the world and sharing their stories with all of you. This year, I’m calling out to ALL Vancouver Canucks AND Utica Comets fans to share their stories. Whether you’ve been fan your whole life, or only a little while, whether you grew up in British Columbia or across the country or in the USA or across the globe, I would love to feature YOU and YOUR story as a part of this year’s series. Everyone has a different story of how this game captured them but through them we are all connected. Fan stories and experiences are some of my favourite hockey stories to share! “Here are some of my hockey experiences. My daughter and I have been Utica Comet season ticket holders for the past 2 seasons. I have been a hockey fan since I was old enough to know what hockey was and throughout the years have attended hockey games at the Utica AUD going back to when the Mohawk Valley Comets played at the AUD in the 70’s and continuing through the Utica Devils and now with the Comets. We have made many friends that also attend the Comets games and share our passion for hockey. We frequently stay after the games and wait for the players to come up from the locker room to get their autographs and to take our picture with them. We have found them to be very friendly and always willing to pose for a picture. There are several players that we seem to chat with more often inlcuding: Carter Bancks, Michael Carcone and Richard Bachman. We seem them not only as athletes but also as people because we have gotten to know a little bit about their personal lives. We have met Carter’s girlfriend, Michael’s parents and we see Rich’s wife and children at many of the games. An interesting side note is hat during a conversation I was having with Michael’s dad, I discovered that he has relatives that live in Utica and his dad’s uncle used live right up the street from where I live. We have have also run into many of the players at the grocery store, the mall or at the gas station. We try to respect their privacy but almost always at least say hello to them. 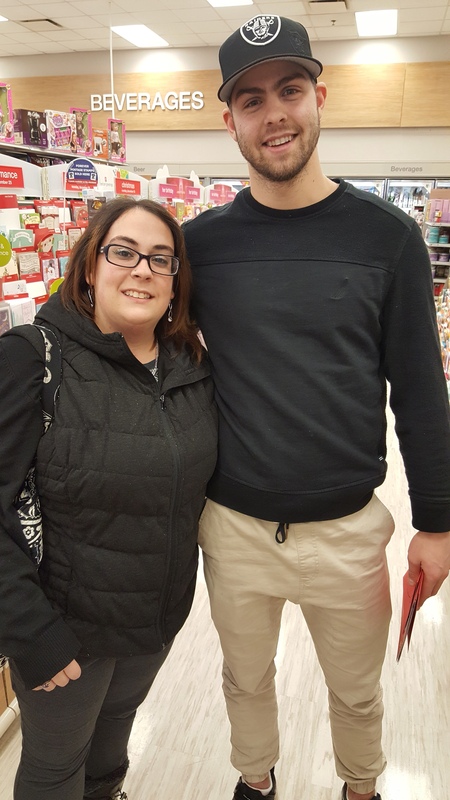 We ran into Michael Chaput at a Rite Aid drug store a few days before Christmas, shortly after he was returned to the Comets by Vancouver. Jalen Chatfield was waiting in the care in the parking lot so we knew that there was another player in the store and we spotted Michael in the card section. We went up to him and said hello, welcoming him back to Utica and the Comets. He was very friendly and thanked us for welcoming him back and said he was looking for a Christmas card for his mother. We chatted with him for a few minutes and my daughter asked if she could take a picture with him. He posed for a picture with him and we thanked him, wished him a Merry Christmas. The Comets were playing the next night at home so I had the picture printed so my daughter could get it autographed after the game. We waited after the game and when he came up, my daughter asked if he would sign the picture. He looked at us and said, “wow that was quick”, as he knew the picture had been taken the night before. My daughter Nicole & Michael Chaput. 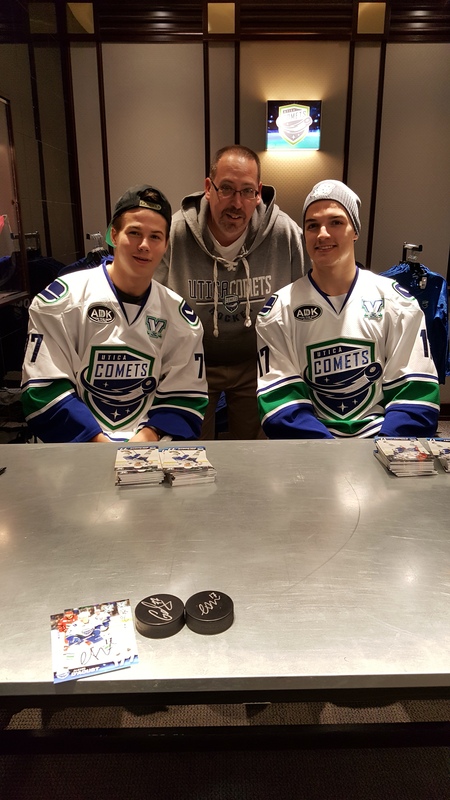 The Comets send a few players each week to the mall to sign autographs during the months of November and December. Through that experience, we have shad some interesting conversations with some of the players ranging from who their favourite hockey team was when they were growing up to what they think of the city of Utica. Nikolay Goldobin is my favourite Utica Comet, the night he was at the mall, he and I became engaged in conversation about his favourite hockey team and his favourite player. I asked him what he thought about our city and he said it was too small for him as he is used to his hometown of Moscow where it is very busy with a lot of people and traffic. I told him what my favourite hockey team was and he grunted and shook his head. We both laughed and exchanged some jabs at each others favourite team. November of last year, my daughter and I took a bus trip to Madison Square Garden to see the Rangers against the Canucks. We had 2 buses loaded with Comets fans and we found out on the way down that the Canucks had recalled Nikolay and he arrived at the Garden just before the pre-game skate but was a scratch for the game. I was hoping that he was going to play as did come out for the pre-game skate but as previously mentioned, he was a scratch. It was quite a thrill for me to see him on the ice at the Garden. It was a my daughter’s first time at the Garden and also quite a thrill for us to see some of the former Comets playing for the Canucks including: Markstrom, Gaunce and Virtanen. The first game after the Canucks returned Nikolay to the Comets, I told him that we were at the Garden for the game and got to see him in Canucks uniform. Thank-you, John for sharing your story and some great Comets stories! Fan stories and experiences are some of my favourite hockey stories to share with you and since I’m asking for your stories, I will share a part of my story as well. Is this the year, that you and your story will be featured? Or do you know someone who would like their Canucks story featured? If you’d like more details on how YOU can be featured in True Blue 2018, simply send me a message on twitter (@nucksaid) OR send me an e-mail to: nucksaid@gmail.com with the subject line: TRUE BLUE 2018. It’s that time of year again at NUCK SAID. Now that it’s officially the Vancouver Canucks off-season: True Blue 2018 is here. Fan stories and experiences are some of my favourite hockey stories to share with you and since I’m asking for your stories, I will share a part of my story as well. Is this the year, that you and your story will be featured? Or do you know someone who would like their Canucks story featured? If you’d like more details on how YOU can be featured in True Blue 2018, simply send me a message on twitter (@nucksaid) OR send me an e-mail to: nucksaid@gmail.com with the subject line: TRUE BLUE 2018. A massive THANK-YOU to all of you, in advance! Here’s to a SUMMER of YOU, the best hockey fans around the globe! It’s summer or more accurately the NHL’s off-season and you know what that means at NUCKSAID! It’s time once again, for True Blue and to put the spot light on you, Canucks fans. This year, it’ll be a little different than my past summer series. No questionnaire, but a more free form in which you can share whatever you’d like about your hockey/Canucks fandom, or focus on just one moment in particular in the team’s history(recent or from the past) that really shaped how you view this game or an experience with other fans that influence your view of the game now or really it’s up to you what you’d like to say. If you’d like to be featured/share the story of your hockey fandom or the moment that’s shaped how you view the game, send me an e-mail to: nucksaid@gmail.com & we will set it up! “Chronicles of a Diehard Canucks Fanatic. Written by Justin Lai. What makes me different from any other Canadian? Honestly not much, I love my Tim Hortons and I live and breathe hockey. My two favourite teams are my hometown Vancouver Canucks and the Pittsburgh Penguins. I’m far from a bandwagon fan though as I know my hockey pretty fluently. I like Pittsburgh as my secondary team because one of my favourite Vancouver Canucks players of all time was a Penguin before, that being Markus Naslund. That and I also like the legends who played for them including Jaromir Jagr, Mario Lemieux and now more recently Sidney Crosby but this story isn’t about them. This story is about my love for the Vancouver Canucks and how an average guy like me is living the dream working for the Canucks and my love for the game. I don’t think there’s one particular moment in the Canucks history that I can pinpoint as my favourite because I enjoy every season cheering them on whether they have losing seasons or whether they make a run to within one win of a Stanley Cup Championship. For me, there’s no in between for my love for the Canucks. I own countless Canucks memorabilia and jerseys, and every year I’m rooting for them regardless of what others believe of my team. The Canucks are my team and I’m proud of that. I love them more than the number of wins they can put up on the ice in a season but my love for them extends to what they do in the community as well. They represent values I believe in which include giving back and the make that a living value day in and day out. Of course my fondest memory was the 1994 playoff run with heroes like Trevor Linden and Pavel Bure but also living through the 2011 magical season that came one win short of their first franchise championship. It was amazing how they captivated a city and brought people of all nations and cultures together during that run. Yes, there was the ugly aftermath in our beautiful city when they lost and that act made me absolutely disgusted and angry as a resident of our beautiful city, but to see the response of those who took part in to help bring those responsible to justice and clean up the damage restored my faith in my city and the true fans of the Vancouver Canucks. My excitement for the upcoming wave of future Canucks comes with mixed emotions. I’m excited to usher in the new wave of future Canucks to hopefully lead this team to success on the ice but to also maintain their commitment to the city and community off the ice. Being a Canuck means more than just an NHL player, it means having pride in being good people on and off the ice, role models to those who cheer you on and aspire to be like you, who look up to you. On the other hand of this excitement, to see our future young stars in the making, it’s also humbling and bit sad to potentially see the end of veteran players who have paved the way for these young guns, none more so than the Sedin twins. Daniel and Henrik Sedin are consummate professionals and excellent players but also world class leaders on and off the ice who I admire as people. I’m living a dream working for the Canucks, heading into my 4th season because I get to be in the same environment, breathing in the excitement of hockey on game days and being a part of a team of outstanding co-workers and friends who make working for the team a dream come true. They preach and practices the Canuck values which I can put into practice not only on the job but also everyday which makes this organization one of my dream companies to work for. They also make it so fun to work there. Anyways my love for the team will never be diminished and whether we finish seasons as the the best team in the league or whether we finish last in the league, I’m always going to be team #TrueBlue and rooting for my Canucks because they’re so much more than just a hockey team to me. They represent the fabric of my beautiful city and living the Canucks values day in, day out is exactly worth being a Diehard fan for. Feel free to connect and talk hockey with my on my Twitter account: (@justinlai01)! Special thank-you to Justin to sharing a piece of his True Blue story! I can relate on so many points! To me, the Canucks represent so much more than just hockey. **If you’d also like to be featured/share the story of your hockey fandom or the moment that’s shaped how you view the game, send me an e-mail to: nucksaid@gmail.com & we will set it up! Today introduces you to, not one but two, Canucks fans. “Today, I’ll share a more recent memory. As a die hard Vancouver Canucks fan, my favourite memory from this off season was getting to attend the prospects game. It felt like a real game experience and there was such an energetic/positive vibe. It was so refreshing to sit wherever we wanted to and best of all, no rude fans. Watching the next generation of Canucks players was very exciting and I look forward to seeing these guys make it on the team in the near future. This felt like Christmas came in July for THIS Canucks fan. Seeing Pettersson get two goals was amazing and thrilling to get a glimpse of what’s to come. Our future goalies made some great stops despite the high scoring nature of the game. I was quite pleased when a bonus team shoot out was announced. One of the few times that I will ever be excited to watch a shoot out. Each player was granted a chance and tried some interesting and comical moves in the added bonus overtime. I was so thankful that Rogers Arena introduced some new menu items in addition to free food and beverages for the evening. Another added bonus for me was attending a behind the scenes tour at Rogers Arena. It was a wonderful experience to walk around my favourite place of all time. I really enjoyed seeing the wall of history featuring many of the Canucks legendary players, Trevor Linden’s locker stall with his old lucky sneakers, the Olympic victory mural, seeing the Great One’s signature on the elevator. Our tour guide was very informative and enthusiastic and equally heartbroken about the outcome of 2011. It was cool seeing the club 500 section and the view of the rink from those seats. Is it Hocktober yet? I am counting down the days until hockey returns and looking forward in particular to two things: Daniel Sedin’s 1000th point milestone and seeing Brock Boeser play in a full season capacity. Special thanks to both Abi & Jeff for sharing their True Blue stories! Once a part of Canucks nation, you’re always one of us! Here’s to hearing, seeing, sharing and learning a few more before the season begins in October! It’s summer or more accurately the NHL’s off-season and you know what that means at NUCKSAID! It’s time once again, for True Blue and to put the spot light on you, Canucks fans. This year, it’ll be a little different than my past summer series. No questionnaire, but a more free form in which you can share whatever you’d like about your hockey/Canucks fandom, or focus on just one moment in particular in the team’s history that really shaped how you view this game or an experience with other fans that influence your view of the game now or really it’s up to you what you’d like to say. If you’d like to be featured/share the story of your hockey fandom or the moment that’s shaped how you view the game, send me an e-mail to: nucksaid@gmail.com & we will set it up! “Why do I support the Vancouver Canucks? Why as a British person, am I even into ice hockey at all? True, it’s not in our nation’s DNA to take to the ice, we prefer grass sports with sports like Field Hockey, Cricket, Rugby, and most of all football (or Soccer, if you prefer); though Ice Hockey is the most popular indoor spectator sport within England, Scotland, Wales and Northern Ireland, even beating our Basketball despite the country producing a respectable number of NBA players! Even with it’s small slice of popularity, the British ice hockey scene is almost non-existent when compared to our reputation as a footballing country. This hasn’t always been the case, however, back in the 1930’s the British national hockey team were one of the most formidable in the World! Often competing and beating the modern day powerhouses of: Canada, USA, Russia, Sweden etc., with the crowning achievement being winning the 1936 Olympics and World Championships as well as various continental titles. Even with this success, British ice hockey has very much fallen to the wayside, making it unlikely that you will ever run into another genuine hockey fan in day to day life. This is why I am so grateful for things like Twitter and Facebook that have helped bring about the Canucks Nation. A collection of Canucks fans from all different backgrounds, nations, religions and cultures. The sport knows no creed, only what team you support. Fans of the Vancouver Canucks often get a bad name, whether it’s about them being fickle, rioters, bad losers…anything bad you can think of, the Canucks fan base has been accused of it. Sure, we have our idiotic element, what sports team doesn’t? What people don’t tell you, is the good things our fan base achieves. For a few years from around 2009 to only last year, I suffered badly with depression and anxiety, and this was also at a time that I lost my Grandad and shortly after, my Grandma. I received messages from Canucks fans from all around the world, some in the UK, some in Canada, some in the US and some from as far afield as Australia and New Zealand. People that I had never met in person, who wanted to see if I was okay, not because they had to but because I’m a Canucks fan. That simple. When I was at my absolute worst, I always knew I had the backing of the Canucks Nation, whether it was them giving me an ear to moan into or whether they just sat up with me chatting all things hockey and life. The Canucks Nation are whiners, the Canucks Nation are idiots is what we hear. The Canucks Nation saved my life is something I don’t hear, the Canucks Nation made me feel like I wasn’t alone is something you don’t hear but they did just that for me. 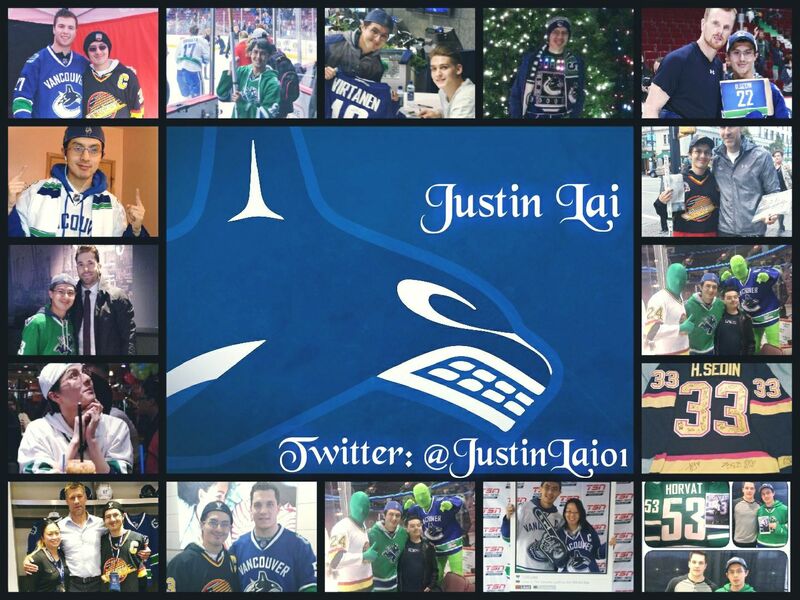 The Canucks Nation aren’t just the best fans in the NHL, but some of the best people in the world. When I was a child, I wasn’t massively into sports but I was into video games one of favourite games was NHL 99 on the PlayStation. And my favourite team was actually the Detroit Red Wings! I had no affiliation to the city of Detroit or the team, they were just really good! To say I supported them would be generous, I more just played as them on the game and said I supported them. In reality, I couldn’t tell you a single player who wasn’t on the starting line-up on the game. In 2001, I went to BC for the first time and who else was in town? The Detroit Red Wings…and because of my slight fascination with them, my dad got us tickets to the game. That game was a 3-0 win for the Canucks but that wasn’t to be a disappointing result for me as little did I know, walking into GM Place that my life was about to change forever. As I first walked out of the concourse into the stands, I was taken aback by the noise and colours all around me, the Dark Blue, Red and Silver, everywhere. The announcers enthusiasm and just the sheer numbers of people all stuck with me. It was unbelievable, I’d never seen such a mad crowd! I instantly fell in love the the home team and quickly dropped any “love” I may have held for the Red Wings. I was hooked. Going forward, I have only been able to see a handful of games like due to a gap of roughly 7,300 km between me and Vancouver. Despite this, my love of the Canucks was born that cold December night at GM place. I’m from a town in England called Stockport, about 20 minutes away from Manchester. Within the neighbouring Manchester; I managed to quench my thirst for hockey with the Manchester Storm, following their dissolution, the Manchester Phoenix, and as much as I loved those nights at the Manchester Evening News Arena, nothing had ever come close to that night in Vancouver. Back in the early, 2000’s, streaming live sports wasn’t easy, so I had to rely on a weekly TV show we had that would give a weekly round-up of the league’s main talking points and some short highlights. It sounds daft now but back then I would make sure that nothing got between me and my weekly hour-long hockey fix. As the internet evolved, so did my love for the sport and the team. All of a sudden watching a game was easier than ever but more importantly, so was connecting with fellow fans from around the globe. Though as I transitioned into adulthood, I could no longer stay up all night watching games and sadly I was restricted to weekend games. This changed in 2009, this is when I first started battling my own mind. I often couldn’t sleep and would find myself inadvertently staying up all night long with nothing to show for it except a headache and uncontrollable yawning. This is when I truly learned what it meant to be a part of a family other than my own, the Canucks family. As I was up all night anyway, I would watch the games online and suddenly my online habits went from searching for the best way to fall asleep to searching about the next big prospect that “the Canucks HAVE to draft”. From dreading waking up the next day to actively being exciting for the day to come and go, just so I could watch the Canucks again. The worst night of my life, quickly turned into the best. It was Game 5 of the 2011 Western Conference Finals: Canucks vs. Sharks. As I’m sure we all know, the Canucks went from a 1-0 lead early on to trailing 2-1 with just seconds left before Ryan Kesler snatched a goal at the death to send the game into OT and then into double OT. It was during the second overtime that “the goal” happened. The goal that defied physics and logic, the goal that sent the Canucks to the Stanely Cup Finals, the goal that saved my life. Once the Bruins series came along, I had started receiving professional help, a step that I may never have taken if not for that night. When we lost Game 7, I was devastated, but most importantly, I was here. Since that summer things haven’t gone overly well for the Canucks but it was around this time I started socializing more with Canucks Nation. I’ve made some truly great friends, both online and in real life thanks to the boys in Blue and Green; sometimes we just moan about how badly the team is doing, sometimes we just like to talk. Whether you’re a diehard season ticket holder or a casual fans who’s only ever seen highlights, everyone is made welcome into the family that is Canucks fans. I had managed to keep my mental health in check for the most part until 2015 when I lost my Grandad. I run a Canucks fan page on Twitter and I’ll generally just chat with other fans and sometimes live tweet games. I made a quick apology for an absence due to losing my Grandad. It wasn’t for any other reason than to let people who’d tweeted/messages me that I wasn’t ignoring them. Within an hour, I’d had nearly 100 messages from people all around the world; they didn’t know me personally, some didn’t even know my real name, all they knew is that I was a Canucks fan going through a hard time and it was literally overwhelming how nice everybody was about it. It’s experiences like this that mean even when I can’t watch as many live games as I’d like to, the incredible community of Canucks fans is something that not only do I hold very dear to my heart, it’s something that is now and will always be a part of my life. Thank-you for your bravery and for sharing your story with all of us, Chris! It’s not an easy task speaking up but it ALWAYS makes a difference. Once a part of Canuck Nation, you are always be a part of the Canucks family! As always, since I am asking YOU to share, it’s only fair that I share MY story as well. It’s no secret that the Vancouver Canucks are my team or that every team across the league has incredible fans and those are the facts, plain and simple. When I stepped into this world that is the hockey fandom, I was not sure how it would be perceived or if I would be accepted, all I knew was that I loved this game and there was no going back. Being part of the Vancouver Canucks fandom and part of the general hockey fandom is one of my favourite things. I know that from the outside some do not understand what it means to be a Canucks fan or how the team has any fans. The truth is that despite what you may have heard or what you may have read, the Canucks do have fans and even more so, loyal fans. Fans that will support the team every season, through the good, the bad and everything in between. That doesn’t mean that there aren’t frustrating moments but it does mean that even in the tough moments, they are still my team. If I’m going to focus on ONE significant moment about why I love hockey, it would be from this past season. In the last year, I witnessed both the bad and the good in being a female hockey fan. The BAD: More so than any other year, I was berated and harassed for not being just a Canucks fan but a female hockey fan. How could I, as a woman, possibly understand all the complexities of the game? Going to the arena and seeing my team play is something that will always feel like magic. Nothing beats seeing a live game, the atmosphere is spectacular from pre-game to anthems to puck drop to the final buzzer. Do you know how awful it was to be sitting in the arena, in the place that feels like home and have it made to feel as though I did not belong? Or to be talked down to in condescending tones about the game? It was absolutely unsettling to my core to be treated as though I was not allowed to be a part of this hockey world. Everything from my different perspective of the game to my jersey choices were unacceptable. Things that were said to me on multiple occasions are far too offensive to repeat but they hit me exactly where they were meant to and for a few moments made me think maybe they were right and that I did not belong in this hockey world. Sounds pretty crazy right? The GOOD: Instead of keeping it inside as I may have been prone to do in the past, I decided to let it out in the only way I knew how, writing about it. In those moments in the last year when I felt under attack for being a female hockey fan, it inspired multiple blog posts and a few social media rants. The response of support I felt from countless members of the hockey community through friends and on social media was overwhelming. I realized I was not alone in my experiences. I learned that despite those voices who tried to make me feel as if women and hockey do not go together, they were wrong. I was embraced by others who have had similar experiences and welcomed by those who welcome hockey fans of all kinds. I was reminded that while these experiences were extremely difficult to be a part of and absolutely disheartening in the moments, these experiences also made me stronger. If anything, instead of turning me away from the game, all of these experiences only made me love the game even more. I know that there will probably be more of those moments down the road when I may be attacked for loving this game BUT the difference is, I will no longer let anyone influence how or when I am a fan of the game or my team. As we edge deeper into the Vancouver Canucks off-season and the local media focus on all of the decisions that will or will not be made, here on NUCKSAID, it means that it’s time to put the spot light on YOU, the fans. The summer tradition continues. What exactly is the True Blue tradition, you ask? Allow me to explain. The True Blue series takes the spotlight off of the angst that is off-season rumour mills and puts it on YOU the fans and YOUR stories. It has become a favourite summer tradition of mine to feature during the off-season. As we count down to the new season around the corner, it is time to share your Canuck stories and how you became a fan of this team, the game and what keeps drawing you back year after year. Over the past three summers, I have had the absolute pleasure of connecting with Canucks fans from all over the world and sharing their stories with all of you. This year, I’m calling out to ALL Vancouver Canucks AND Utica Comets fans to share their stories. Whether you live in Canada or the USA or across the globe, I would love to feature YOUR story as a part of this year’s series. Fan stories and experiences are some of my favourite hockey stories to share with you and since I’m asking for your stories, I will share another part of my story as well. Is this the year, that you and your story will be featured? Or do you know someone who would like their Canucks story featured? If you’d like more details on how YOU can be featured in True Blue 2017, simply send me an e-mail to: nucksaid@gmail.com with the subject line: TRUE BLUE. I look forward to hearing and sharing as many stories as you are all willing to share and have read by many more throughout the summer. Here’s to making the long off-season a little more enjoyable by sharing all kinds of hockey stories!